Colin Jacobs posted a career-best five points Saturday as Prince George opened the regular season with a 6-0 blowout of Everett. Jacobs got the ball rolling for the Cougars with a penalty shot goal at 6:43 of the first period. He later struck on the power play in the final minute of the second. The five-point night (2+3), which eclipsed Jacobs' previous high (4) set in December 2010, was a first for a Sabres prospect since Kevin Sundher's one-goal, four-assist performance last October. The Cougars and Silvertips will engage in a rematch Sunday. Joel Armia scored his third goal of the year as Assat defeated HPK 4-1. The mark, which came in the opening minute of the second period, tied the game 1-1 as Assat began to take control of the game. The Aces get back at it Tuesday when they host HIFK. In Sweden, Linus Ullmark came on in relief of Daniel Hansen, stopping seven of eight shots in 39:57 of work as Mora rallied from a two-goal deficit to defeat Djurgardens 5-4 in a shootout. Ullmark, who was making his Mora debut, allowed a power play goal off a quick feed from behind the night shortly after entering the game but held firm from there while his team carried the play over the final twenty minutes to force extra time. Mora returns to action Tuesday against Vasteras. Elsewhere, Dan Catenacci notched a goal and an assist as Owen Sound defeated Saginaw 5-2. Catenacci has four points (2+2) after two regular season games. The Attack continue play Thursday at Barrie. Justin Kea finished -1 for the Spirit, who kick off their home schedule Thursday versus Sudbury. Brady Austin was -2 as Belleville needed a shootout to defeat Plymouth 3-2. The Bulls take on the Battalion Friday night in Brampton. 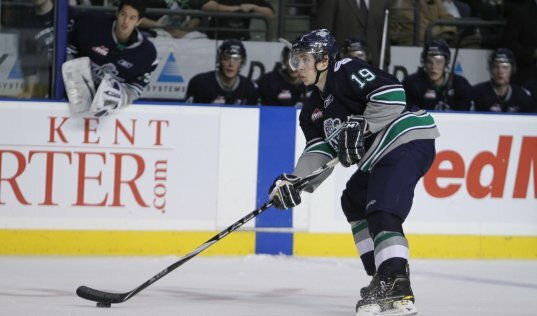 In the WHL, Logan Nelson picked up a pair of even-strength assists in Victoria's 3-2 win over Vancouver. Nelson showed off his speed and passing on the second helper, breaking into the Giants zone and deftly sending a cross-ice saucer feed to Alex Gogolev. The Royals are off until Friday when they begin a two-game set with Kamloops. Andrey Makarov made 25 saves as Saskatoon lost their home opener 5-2 to Prince Albert. The Blades made ti tough on themselves from the start, surrendering three goals in the top half of the first period including two on the power play. The Blades next take the ice Wednesday at Brandon. I was about to ask you if Jacobs is the next Steven Shipley. Glad to see Jacobs get a good start. I hope he keeps up the good play.